A chic guestroom at the Calistoga Motor Lodge & Spa. 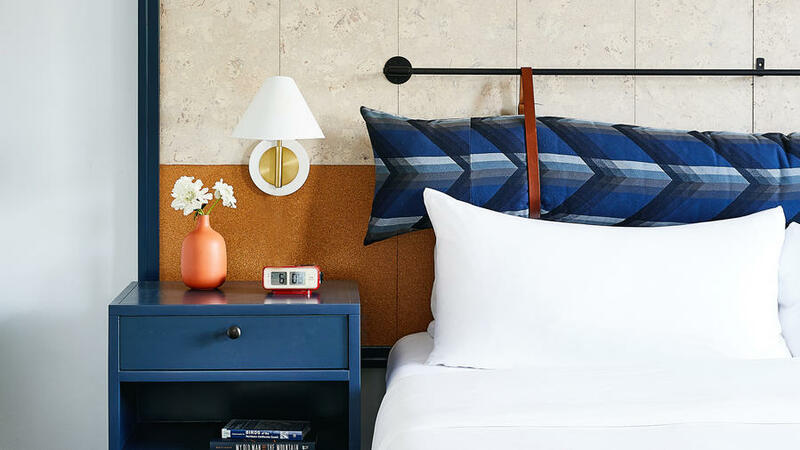 Old is new again in wine country these days, as three mid-century modern motels have gotten new life as boutique hotels with period flair. Two of the properties are on the Sonoma side of the Mayacamas in Santa Rosa; the other sits at the top of the Napa Valley in Calistoga. All three of the pet-friendly hotels offer style and substance at a fraction of the cost of bigger resorts. In the wake of the late 2017 wildfires to hit wine country, the hotels also are giving back to the communities they serve. Fun is the name of the game at this circa-1946 motor lodge (pictured above), which was redesigned with a camper van motif by New York-based design firm AvroKO. All 50 rooms are stocked with hula hoops and jump ropes, and the lobby has board games, lawn games, and cruiser bicycles for guests to use. The hotel also hosts regular weekly maker workshops with local artisans who share their skills. Linger at MoonAcre Spa & Baths, which draws upon the mineral water for which Calistoga has become famous, and offers a mix-your-own mud bar. Following the fires, the spa offered rock-bottom discounts on treatments for anyone who lives within a 50-mile radius. Later in 2018, the property expects to open an on-site restaurant with a wood-fired kitchen and beer garden. From $208; . The kitschy-cool lounge at The Astro. Original artwork and mid-century modern furniture highlight the second incarnation of this circa-1963 motel in Santa Rosa’s up-and-coming SofA (pronounced “sofa”) neighborhood near the Luther Burbank Home & Gardens downtown. The Astro is owned by the same folks who run the Spinster Sisters restaurant around the corner, so all guests receive a $15 voucher to use toward dinner there during their stays. The hotel also goes out of its way to be family-friendly; kids can borrow books from a modest children’s library in the lobby. The Astro has played a major role in the region’s recovery from wildfires—before the grand opening in January 2018, the hotel was full of refugees; after opening, one-third of the 34 rooms will be set aside for FEMA-eligible survivors. From $160; . Guests enjoying the pool at The Sandman. It might have 134 rooms spread across three buildings, but the new-and-improved Sandman manages to cultivate an intimate vibe with marble-topped café tables, hand-woven herringbone throws, and custom quilts hung on the walls instead of headboards. The circa-1973 motel also has a family suite with bunk beds. Be sure to save time for the pool, which boasts a variety of inflatable rafts for lounging and a pool house that serves snacks and beer, wine, and cocktails until 8 p.m. Wednesday through Sunday. Starting in January 2018, the Sandman launched a package through which it would donate $10 from every booking to the Redwood Credit Union North Bay Fire Relief Fund. There also are special deals for Russian River Brewing Company’s release of Pliny the Younger in February. From $159; .